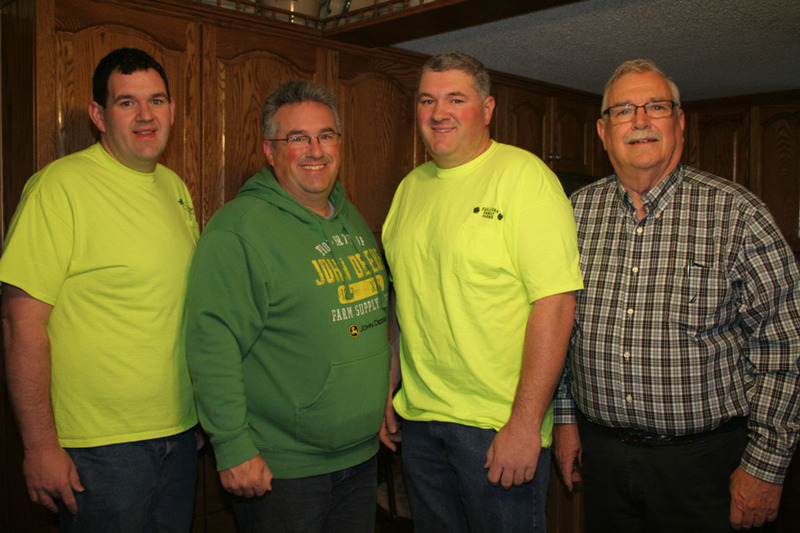 Running the day-to-day operation at the Sullivan Family Farms operation are, from left, brothers, Joe, Tim and Pat and their father Mike Sullivan. 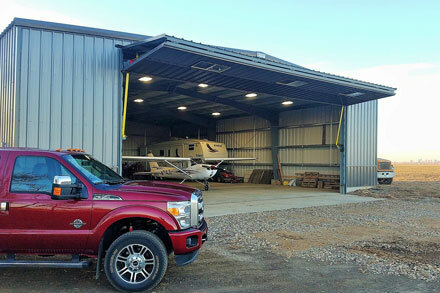 The 47'7" x 18'6" bifold door has two large windows that allow for natural light to enter the building. 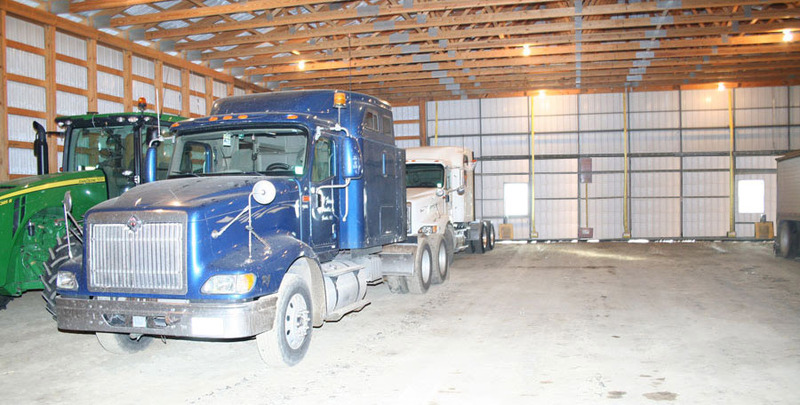 The building is built deep enough to store equipment with room left over to park a pickup sideways in it. 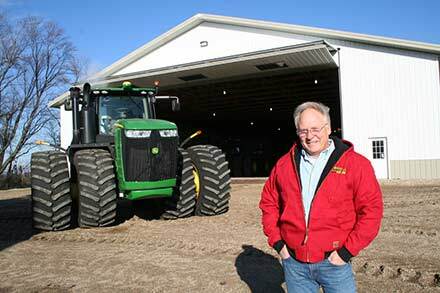 "To be honest with you, back in 1968 you hardly had any money to farm. You just kind of put a package together that you could live with trying to expand a little at a time so that you didn't go broke doing it. 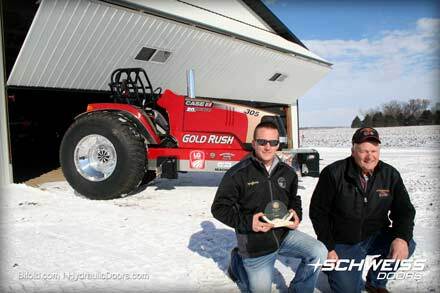 It was probably just as tough back then to get going as it is now," said Mike. The Sullivan Family farmsite is located north of Franklin. 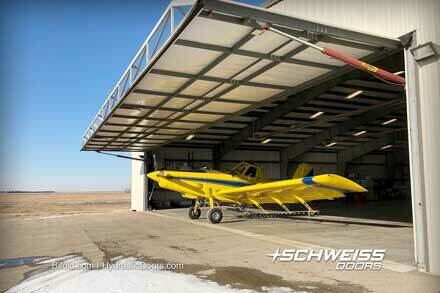 These three buildings have three Schweiss bifold liftstrap doors and one hydraulic door on them. 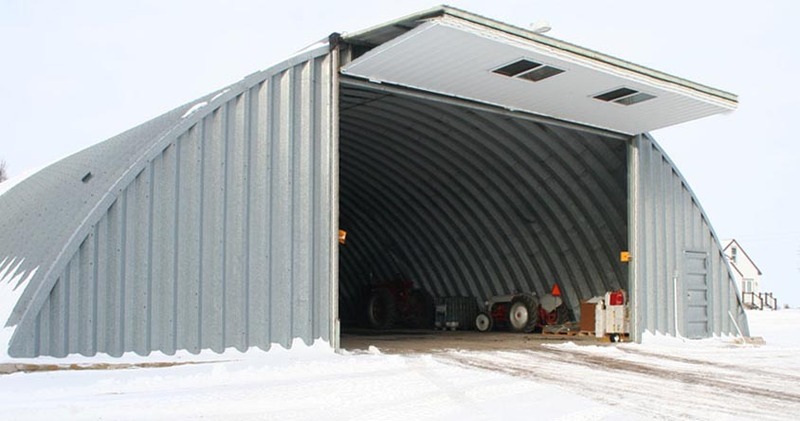 A quonset building has the fifth Schweiss door. 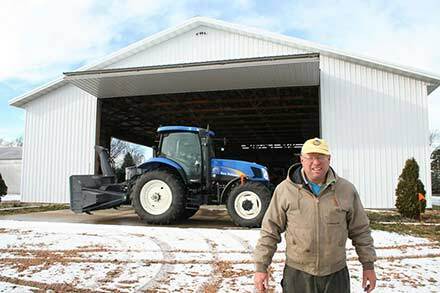 When he first started farming, like many other farmers, livestock was also in the picture. He said he raised hogs for about the first 10 years. 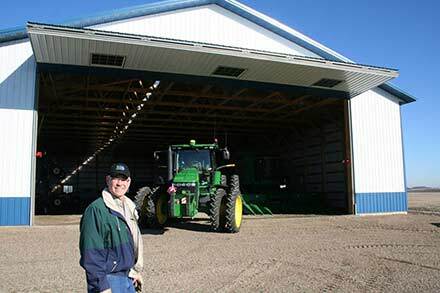 He also did a lot of work with Green Giant during the pea harvest with his tractor and trucks. 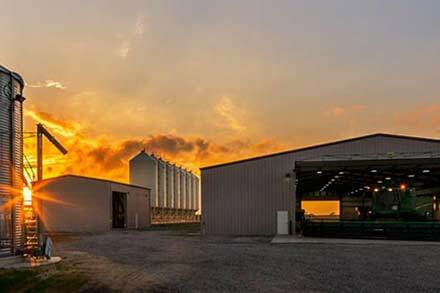 Their large acreage farm, on which they now exclusively grow corn and soybeans, evolved from when Mike's great grandfather, Dennis Lorden, started farming two 80- acre plots north of Morton, MN just after the turn of the century. 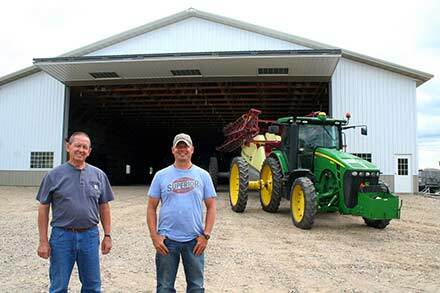 Grandfather, Tim Sullivan and Mike's dad, Jim Sullivan, also farmed on this same land north of Morton. 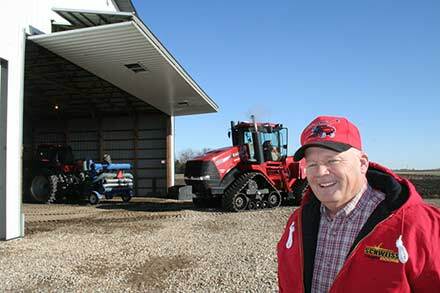 A lot of farming back then was done with horses; now modern-farming practices using GPS and such is the norm for the Sullivan's. 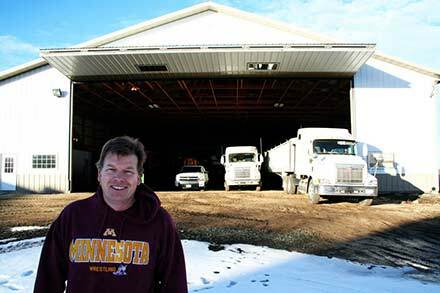 The family-run Morton, MN Century Farm operation is under the mentorship of Mike Sullivan, assisted by able sons, Tim, Joe and Pat, who now operate out of Mike's homesite north of Franklin. 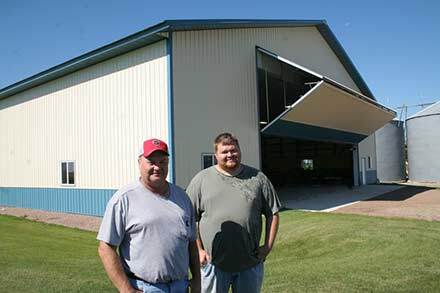 They now employ four full-time workers and quite a few seasonal workers. Mike and his wife, Jane, also have one daughter, Molly Lorang, a Franklin School Special Ed teacher, and have 10 grandchildren to enjoy. 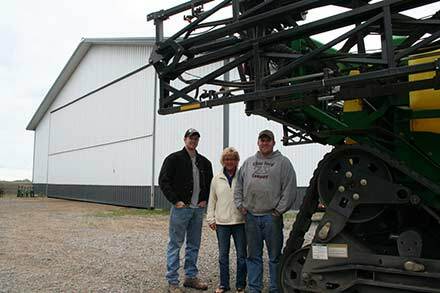 Pat, Tim and Joe said they technically started farming seriously as teenagers, but like most farm kids they grew up helping dad. 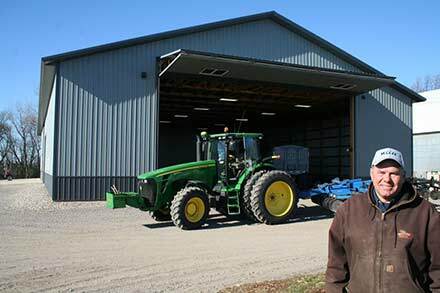 "The boys have gone to a lot of decision planning seminars to keep them up very well on the latest farming developments," said Mike. Each has specific and combined duties. "Tim is basically head of the office. He takes care of paying the bills and doing all the paperwork that needs to be done everyday. 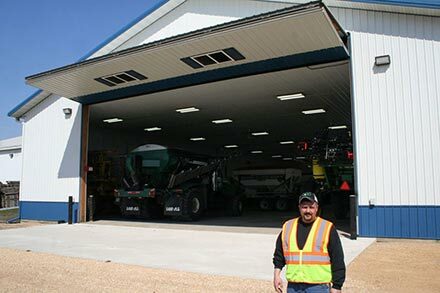 Pat is the shop manager taking care of all the help and making sure all the equipment is ready to go, and anything that needs to be done from day-to-day. 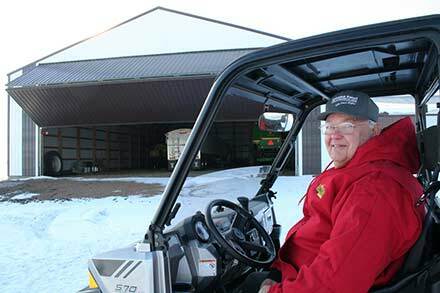 Joe is kind of the overseer of all the precision and GPS technology to make sure that works. He also works with Pat and Tim when needed. The boys all kind of take orders from each other. 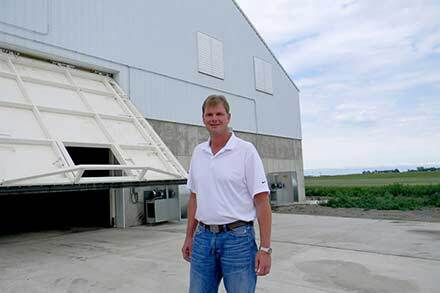 Sullivan Farms got their first Schweiss bifold door about 20 years ago and have added four more Schweiss doors since then; one of which is a 36'10" x 17'6" hydraulic door. 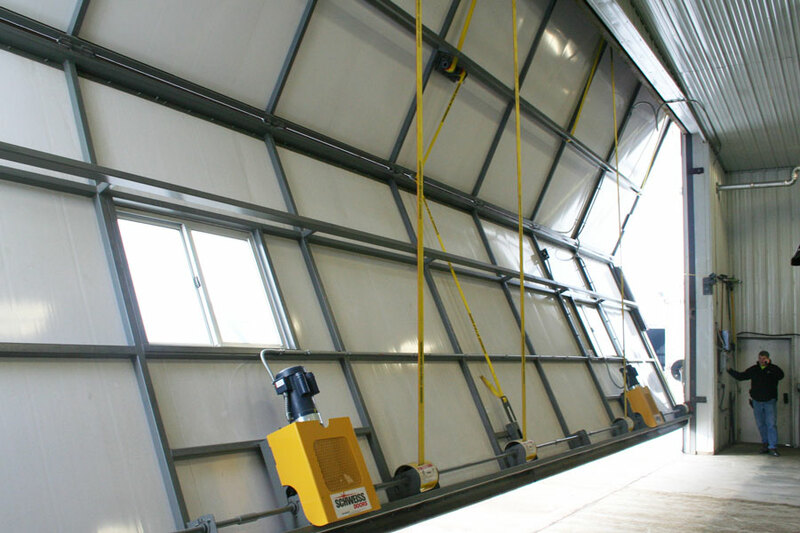 The bifold liftstrap doors range in size from two 44' 7" x 18'6" to a 39' 8"x 15'6" and 26' 6" x 15'4". 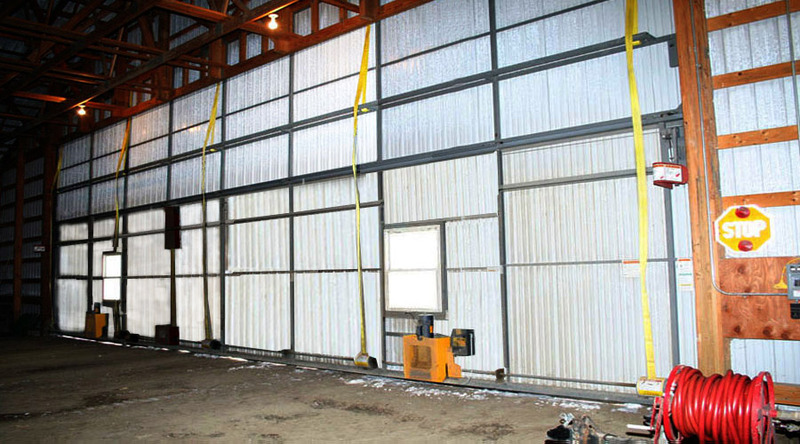 The very first bifold door received a conversion from cables to liftstraps.The one quonset building was the first structure to be fitted with liftstraps. Sliding doors were all replaced with Schweiss bifold doors. 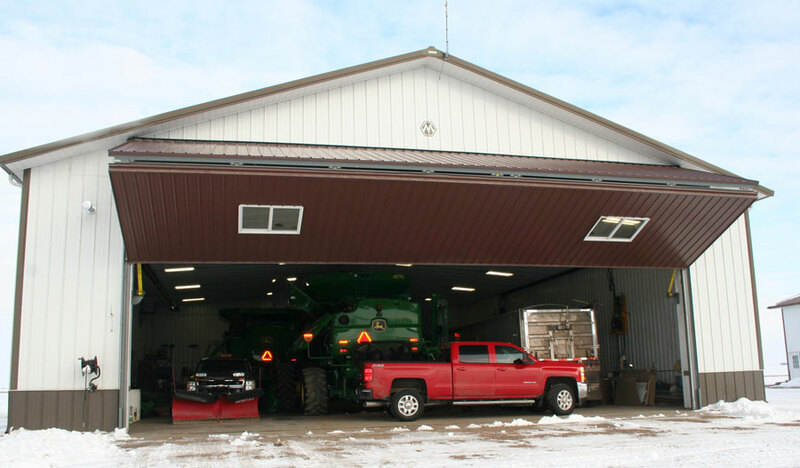 The doors also have a multi-channel master remote system so they can open and close each door from the same handheld remote; you just select which door you want opened from the cab of your tractor, combine or pickup. 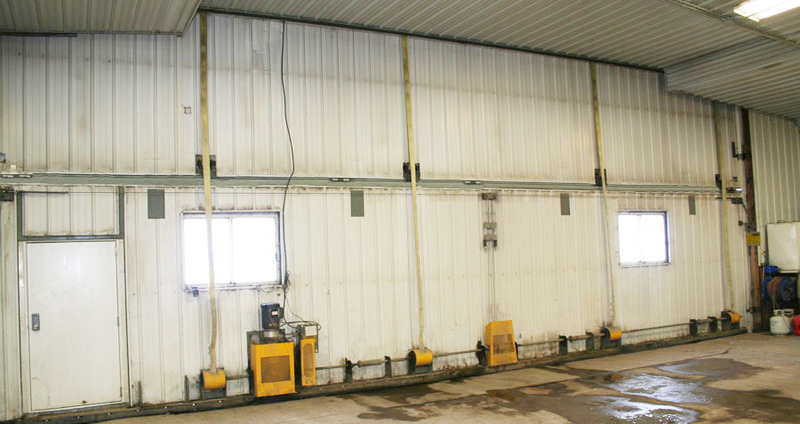 They have one hydraulic door, used mainly for moving diggers in and out and to open up the east sidewall of the building. 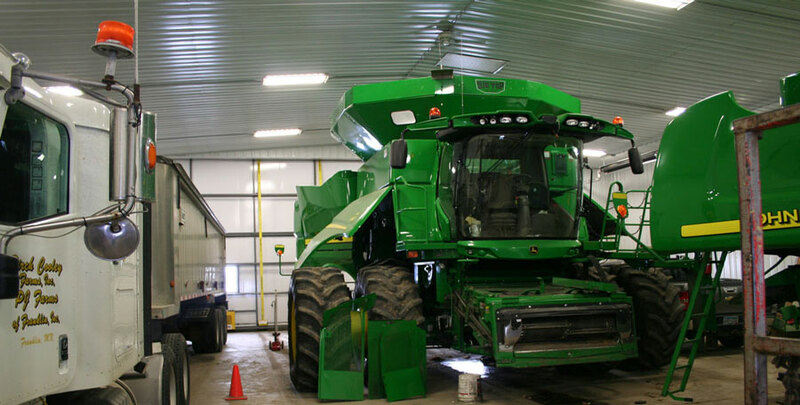 They like how it seals up nice and another benefit is the hydraulic pump was mounted up above the floor out of the way. 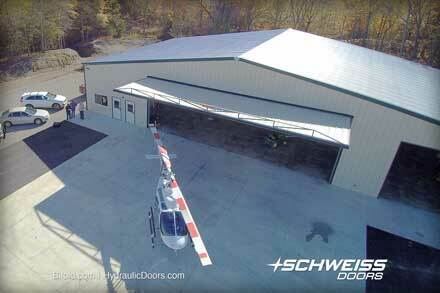 "We have a Schweiss hydraulic door, but prefer the bifold doors. 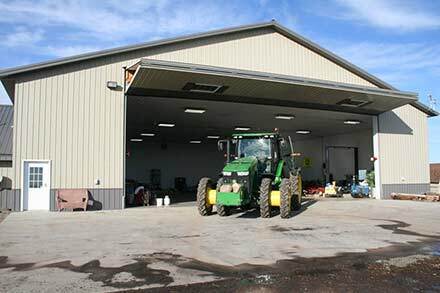 We got the hydraulic door on the east sidewall when we converted the building next door to a shop that had sliders on it. We didn't want to lose any headroom, we wanted to stay 18' clear. 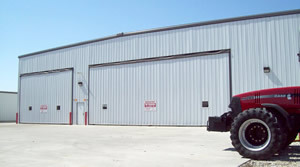 The same building has the 47' 7" wide x 18' 6" bifold door on the south side." 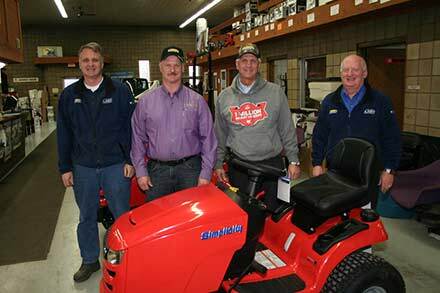 "Dependability has been excellent, quality has been great, service has been excellent. 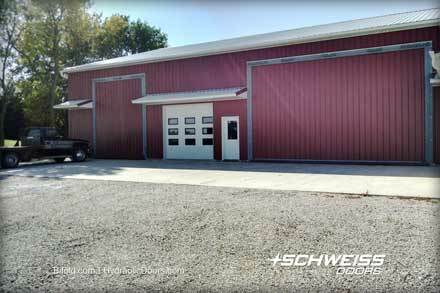 We have five doors and have been satisfied ever since we purchased the first door and that's why we keep coming back to Schweiss. 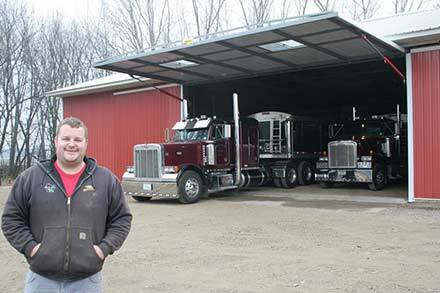 The doors have made things a lot easier." 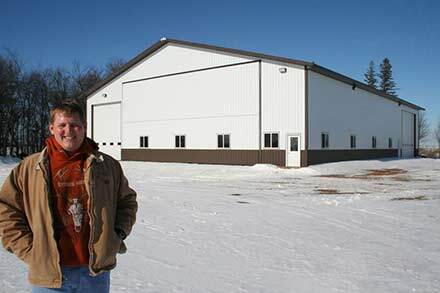 To give you an idea of how dedicated the Sullivan's are to Schweiss doors, Joe said, "When we built the east 80' x 150' building, we had two bids. The one who wouldn't put a Schweiss door on our building didn't get the job. The family has known Mike Schweiss forever and we don't even look at anyone else. 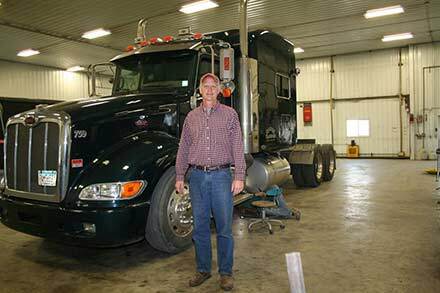 Schweiss customer service and reliability is second to none; Schweiss gets things done." 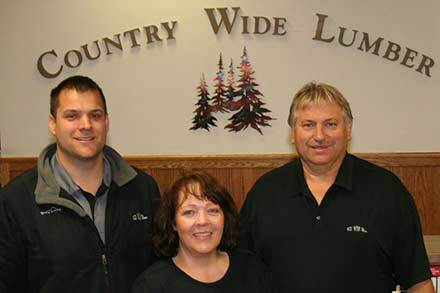 Mike concurred, "Dependability has been excellent, quality has been great, service has been excellent. We have five doors and have been satisfied ever since we purchased the first door and that's why we keep coming back to Schweiss. The doors have made things a lot easier." The middle Morton building has a bifold door on the south side and used to have a sliding door on the east side. The Sullivan's replaced it with this hydraulic door on the sidewall. They chose a hydraulic door for maximum headroom. 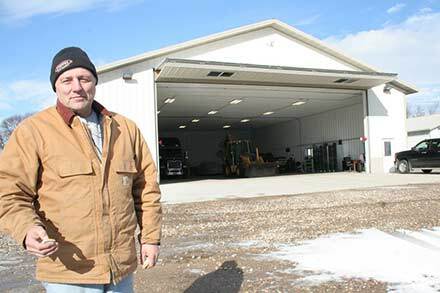 "Our shop doors are used a lot, they probably go up and down 20 times a day, I'd say a couple times an hour when we are busy, and especially during the winter," said Tim. 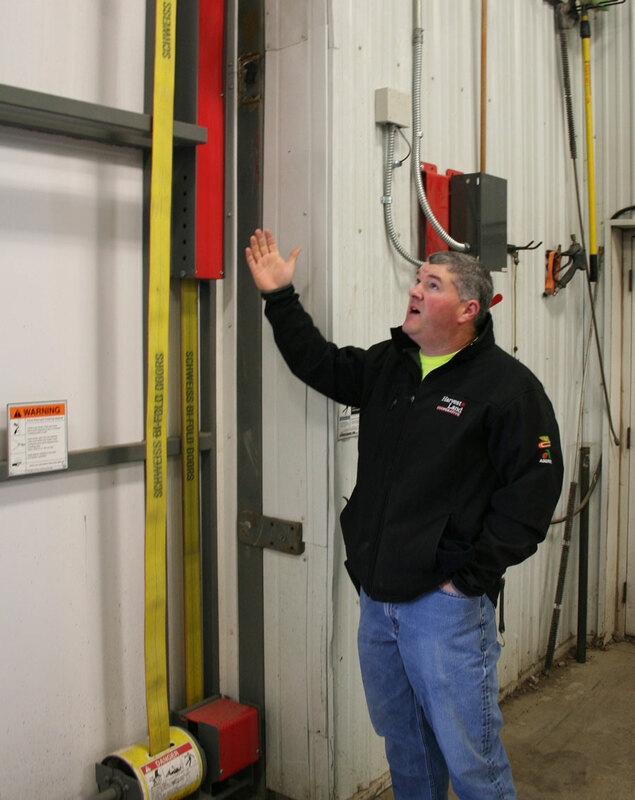 "The new high R-value insulated panels are way better than foam insulation and skin on the inside of the door. The panels go way up to the top of the door and won't break off like foam insulation. We also have the new Schweiss (strap latch) locking system on this door; the door is always tight. There are zero cables now and it has two benefits. When the door is all the way up and its windy it keeps the door against the track. 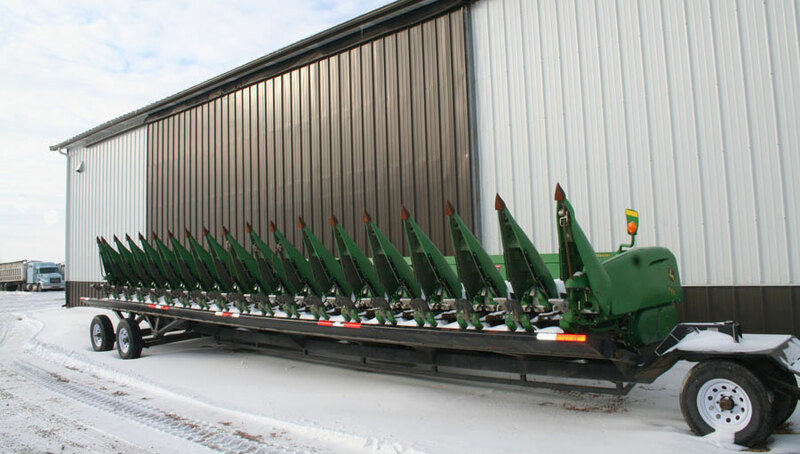 The other thing I like is it has two roller bearings on each side instead of one to spread the weight around." 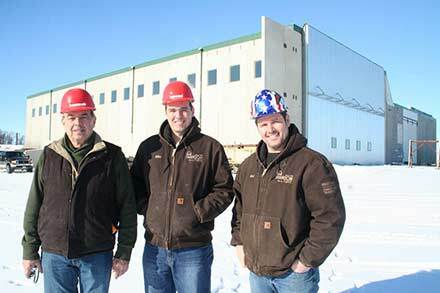 Tim and Joe said they are impressed with the new Schweiss high R-value interlocking insulated paneling on the big shop door. 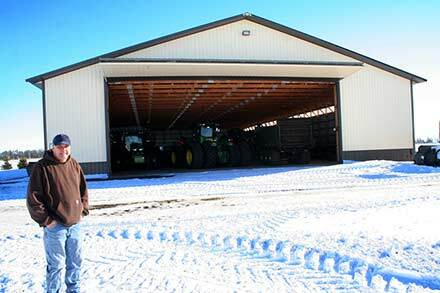 Pat agreed, "The new insulated panels are way better than foam insulation and skin on the inside of the door." 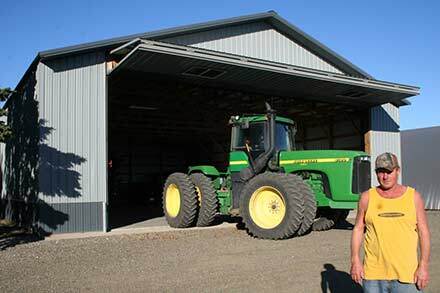 "The panels go way up to the top of the door and won't break off like foam insulation," added Tim. "We also have the new Schweiss (strap latch) locking system on this door; the door is always tight. There are zero cables now and it has two benefits. When the door is all the way up and its windy it keeps the door against the track. 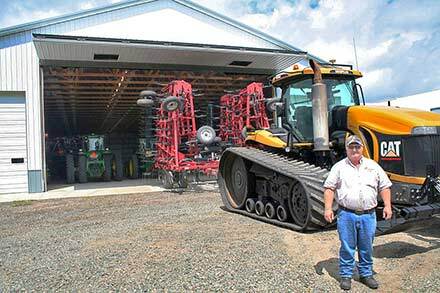 The other thing I like is it has two roller bearings on each side instead of one to spread the weight around," explained Pat. 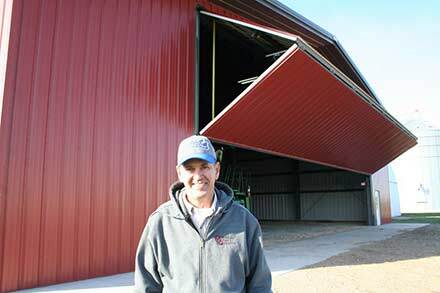 "The nice thing about the bifold straps on our doors is it sped the doors up; they go up and down much faster. 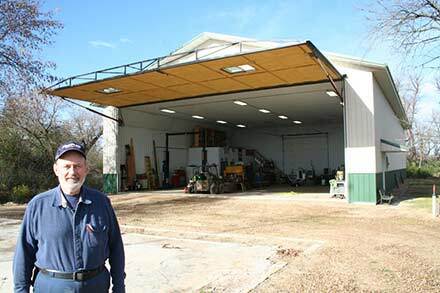 You don't get any of the cable stretch or wear," said Pat talking about the strap converted bifold door that has been in operation since 1997. 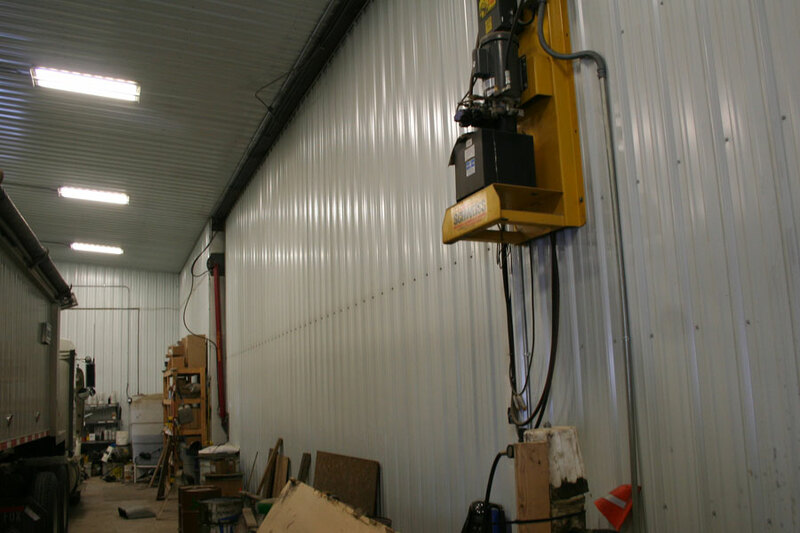 When they were trying to decide what size new door to put on the south side of the shop they were thinking of raising the shop 6 ft. to give additional headroom. Mike Schweiss talked them out of that expensive endeavor which would have also resulted in downtime for the building use, and now they are glad they didn't do that. 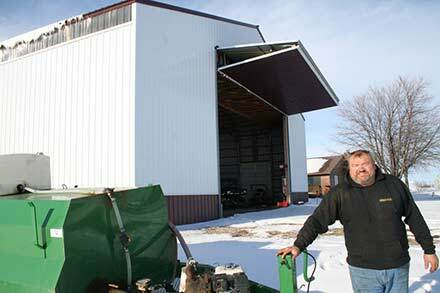 Tim said that Mike Schweiss offered some useful advice on the new building noting that they should allow some room on the sides to store stuff that accumulates on the inside of the building. Pat Sullivan points to the new Schweiss Straplatch system that uses no cables. The Sullivans all said that it locks the door in very tight to the building even during very windy days. Another plus pointed out by Pat Sullivan is the double roller system that runs along the rail when the door is being opened and closed. Their doors get extensive use all year-round, opening as much as 20 times a day. 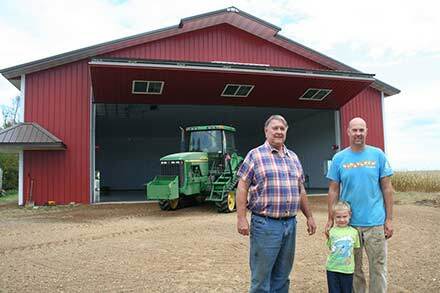 The Sullivan's were impressed with the new Schweiss interlocking insulated panel system. It eliminates the need for an inside liner, has great R-Value and gives the door a nice clean look. Notice how well lit the interior of this shop is. Light also reflects off the new interlocking panel system on the bifold door to brighten up the entire shop and equipment. 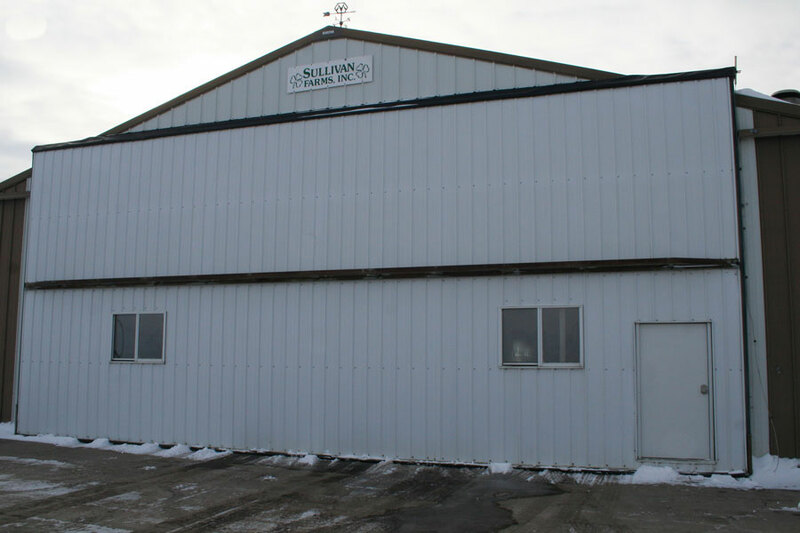 The Sullivan's newest building is 80'x150' and gives ample room to park semi's and other equipment. The bifold door is 39'8"x 15'6". Two large vertical windows bring additional light into the building. 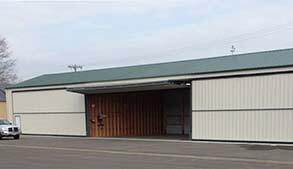 The closed bifold door gives a nice sleek look to the new east equipment storage building. 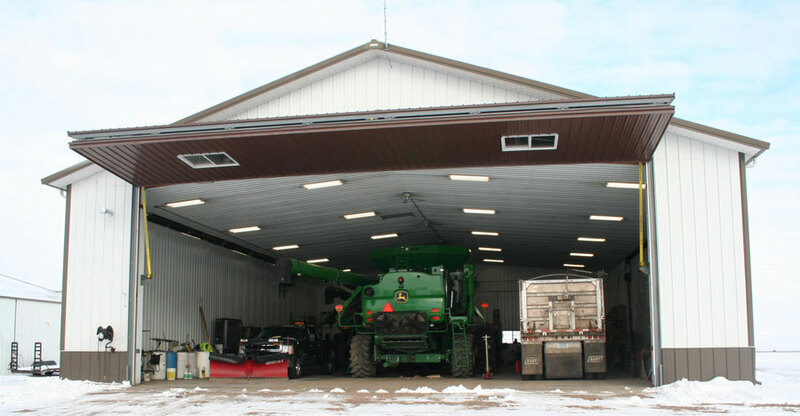 The Sullivan's 36'10"x17'6.5" hydraulic door doesn't get much use during the winter months. When it does, the Sullivan's often use it to get their diggers in and out. A short ways into the door opening is a semi service pit that can be covered. 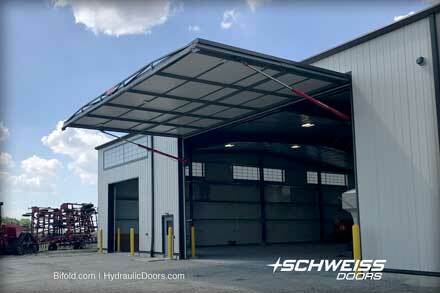 This gives a closer look on how the Schweiss hydraulic door was retrofitted to replace a sliding door that was originally on the new 80'x150' shop. Five liftstraps, each capable of lifting 29,000 lbs. lift this big door safely, quickly and quietly. 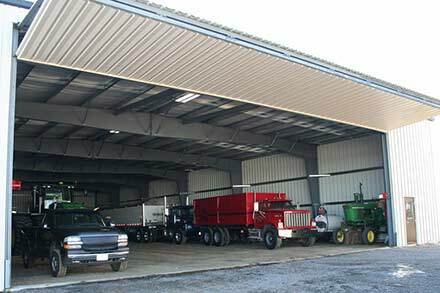 The 17' 6.5" tall bifold door on this cold storage building gives ample headroom for semi trucks and trailers and other large farm equipment. 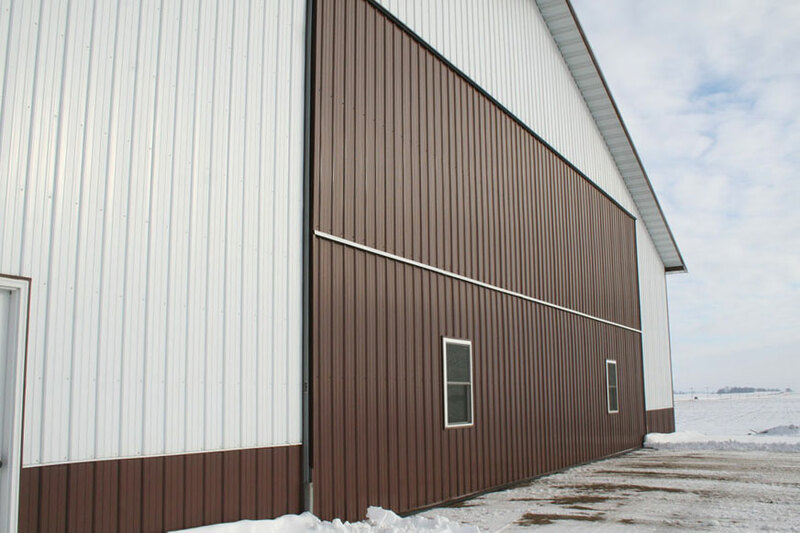 The quonset building on the Sullivan farmsite was the first building to be fitted with a Schweiss bifold liftstrap door. The bifold door replaced a sliding door. 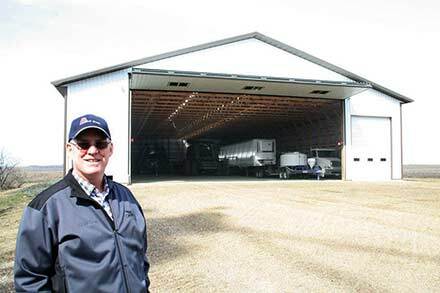 Joe Sullivan said if he had it to over again, he would have opened the entire endwall of their round roof quonset building to gain width to make it easier to bring equipment in and out. 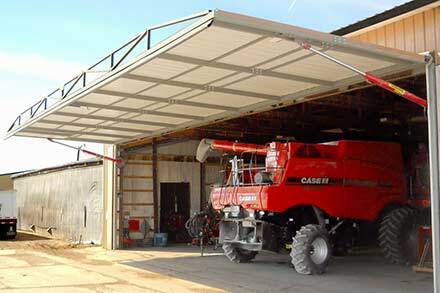 The large bifold door provides a nice shaded canopy and keeps rain out of the building when wide open. 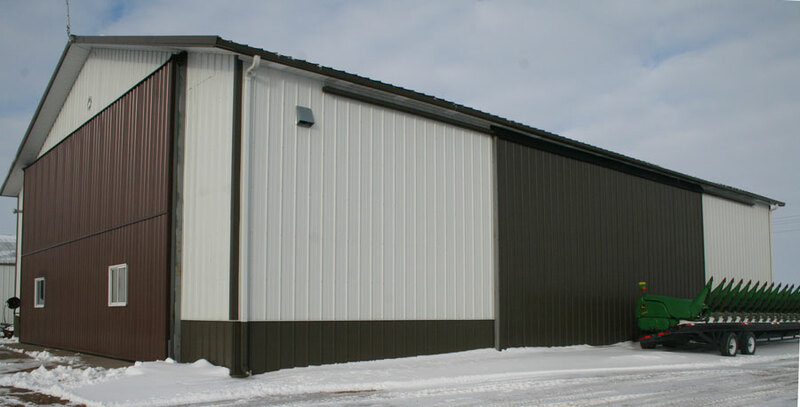 The new building erected by RBC in Redwood Falls matches the look of the Morton Building beside it. 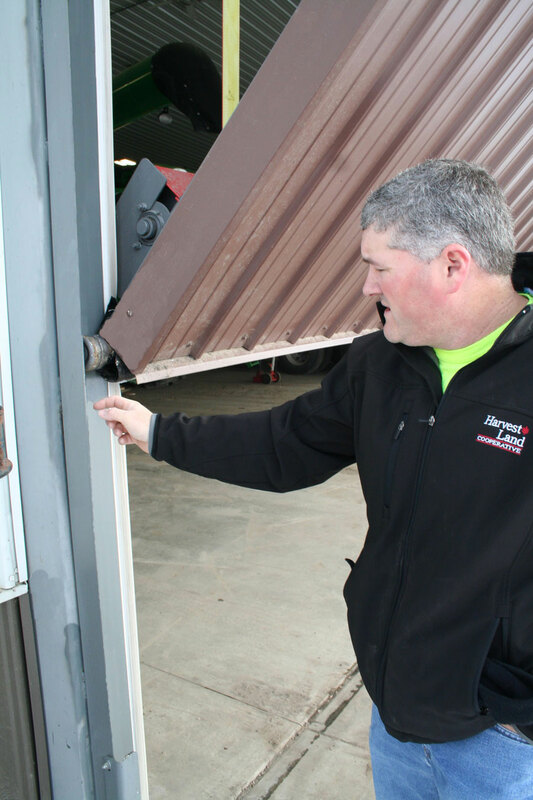 The large bifold liftstrap door opens wide for maximum headroom. This 26'6"x15'4" bifold door has been in operation for about 20 years and is still functioning well. The Sullivan's first bifold door originally was a cable door that was retrofitted to liftstraps. It has a walkdoor for convenience.